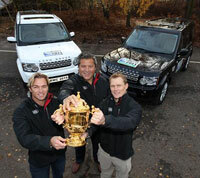 Land Rover's support of both tournaments extends the company's strong association with the sport of rugby. In recent years Land Rover has enhanced its role of Official Vehicle of England Rugby, Premiership Rugby and the UK's Land Rover Premiership Rugby Cup with the additional sponsorship of the last three British & Irish Lions Tours to Australia, New Zealand and South Africa, as well as the forthcoming sponsorship of the Emirates Airline Dubai Rugby Sevens next month. John Edwards, global brand director, Land Rover, said: "This announcement marks a significant development in the partnership between Land Rover and Rugby. The company is proud of its ongoing support of the sport from a grassroots level to the world class game and it is fitting that the world's finest all-terrain vehicles - sold in over 160 markets worldwide - are now supporting the world's ultimate rugby competition." "The International Olympic Committee's decision to include rugby in the Olympic Games from 2016 will have a hugely significant impact on the growth of the sport in emerging rugby markets such as America, China and Asia. This growth offers Land Rover a fantastic opportunity to further engage with our customers, and general sports fans across the globe." Rugby World Cup Limited chairman Bernard Lapasset said: "This long-term partnership with one of the world's most recognisable brands further enhances the enormous prestige and attraction of Rugby World Cup in the global market place." Land Rover will be an Official Sponsor and Official Vehicle of next year's highly anticipated tournament in New Zealand which will be attended by more than 1.6 million spectators and watched by a global TV audience of well over 4 billion in more than 200 countries. Former New Zealand Rugby International Zinzan Brooke, who was present at yesterday's announcement, said, "The whole of New Zealand is ready and waiting for the Rugby World Cup to start. I am confident it will be a tremendous tournament hosted by millions of friendly, rugby-mad New Zealanders. Our country is such a diverse, beautiful, and in places, rugged landscape that it is great news for the tournament to partner with a prestigious and tough brand as Land Rover." Edwards continued, "Today, we are also thrilled to be confirmed as a top-level Worldwide Partner and Official Vehicle for Rugby World Cup 2015. We have been a long-term investor in the development of the sport in the UK, so we are extremely excited to be furthering our association to the very highest level when the Tournament returns to England. "Through the Land Rover Premiership Rugby Cup which involves more than 7000 children each season, Land Rover in the UK is helping to encourage the budding stars of the future - who knows...maybe some of them will have the privilege of playing in the tournament in 2015!" Land Rover ambassador Josh Lewsey said, "I have been fortunate enough to play in two Rugby World Cups and so know first-hand how the tournament excites fans around the world like no other. I am eagerly awaiting the start of next year's tournament as New Zealand is always a special place to visit - especially to watch rugby! "I have also seen the impact that our win in 2003 had on the growth of the sport here in England, and to have such a major company as Land Rover on board so early in the planning will ensure fans get involved and excited about the Tournament as soon as the final whistle blows in Auckland next October. "Rugby World Cup is the pinnacle of the game, and Land Rover's association will only help the sport continue its rapid growth." For further information and images go to www.media.landrover.com.